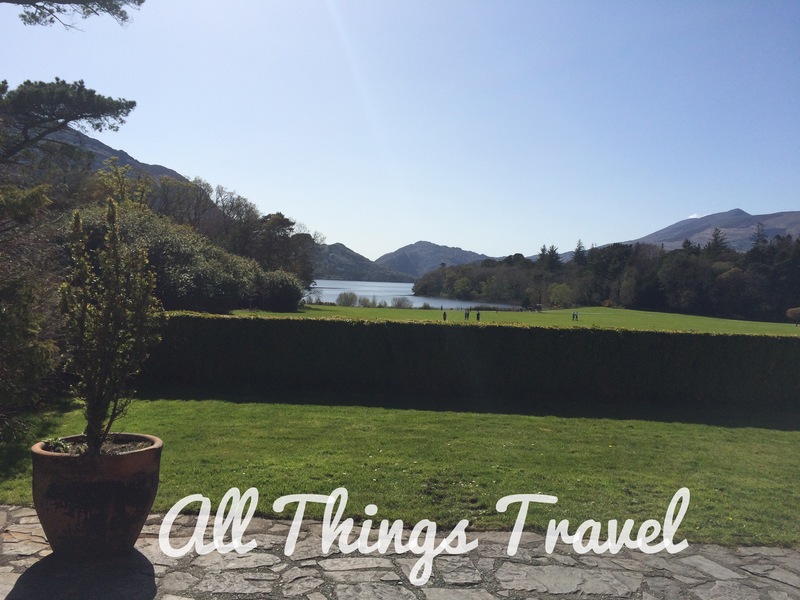 On June 27, 2015, the Irish Times in partnership with Discover Ireland awarded “Ireland’s Best Day Out” to Killarney National Park and I can see why. Our first stop on N-71 approaching the park from Kenmare was at Ladies View, named for Queen Victoria’s ladies-in-waiting who fell in love with the view while on a visit back in 1861. Views of the lakes and bogs with MacGillycuddy’s Reeks in the background still delight visitors today and we joined their ranks. Nearby Torq Waterfall is just one of many waterfalls in the park. The trail was an easy walk through the woods with beautiful scenery including the emerald-green moss covering the ground and trees that defied capture by my camera. I expected to see a leprechaun or at least a fairy in this magical place but alas, saw neither. 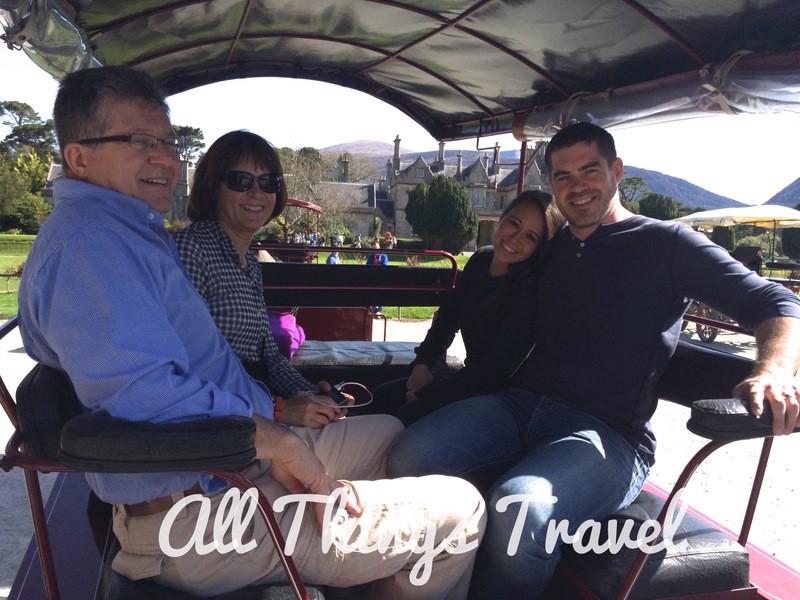 But by far the most pleasant and memorable tour of Killarney National Park has to be by jaunting car. 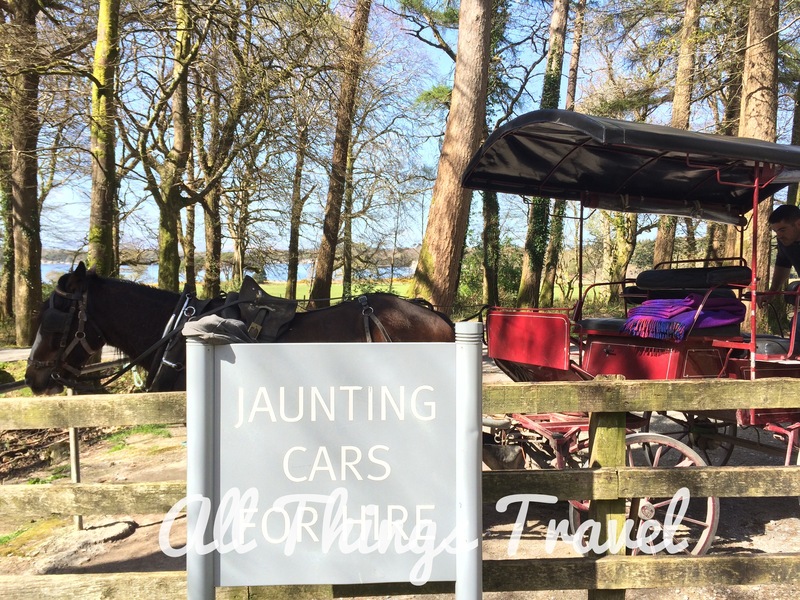 A jaunting car is a horse-drawn cart with a driver who is called a jarvey. For 40€, the four of us enjoyed a uniquely Irish experience that provided one of the highlights of our trip to Ireland. For a sample of our ride, check out my YouTube video: http://youtu.be/iIjbPPH3BJk. (Just click on it; it will take you directly there.) Our driver, Con, was lively and informative giving us details about the lakes, fishing, wildlife, vegetation and more. For example, I commented on the beautiful rhododendron just starting to bloom throughout the park and learned that it’s actually an invasive species that needs to be controlled if not eradicated. The park is also home to the only remaining herd of Irish red deer. The population was at one time reduced to about 100 head but today has grown to around 600. 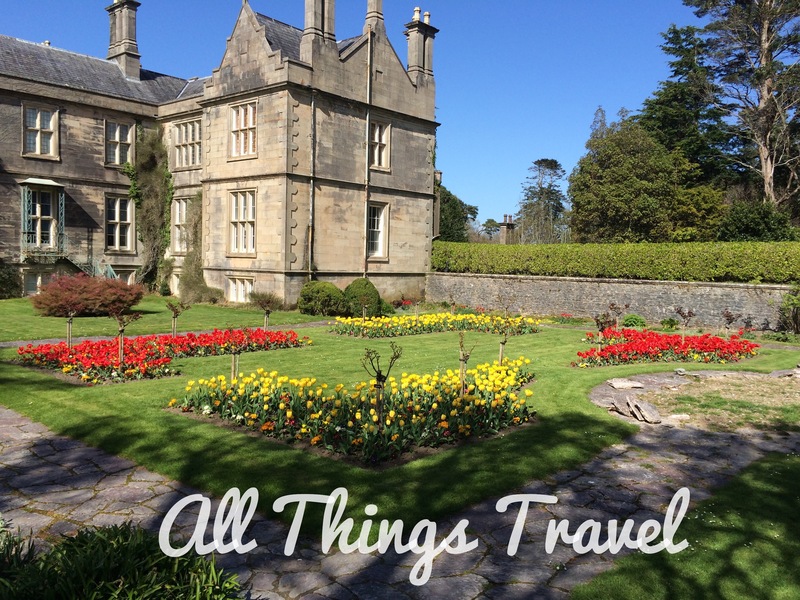 After several stops for lake views and photos, we arrived at Muckross House where we spent an hour exploring the grounds and gardens while our driver waited. This beautiful Victorian mansion was completed in 1843 for Henry Arthur Herbert and his famous watercolorist wife, Mary Balfour Herbert. You can check out her beautiful watercolors here: Mary Balfour Herbert watercolors. The gardens are renowned and although April is early for gardens, we were impressed with what we saw. 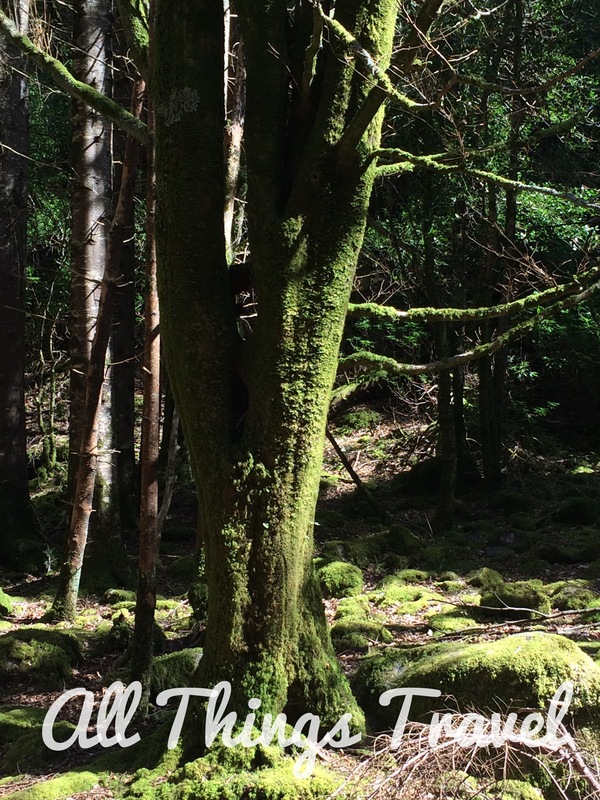 Established in 1932, Killarney became the first national park in Ireland when Muckross House and the 25,000 acre estate was gifted to the nation upon the death of the owner’s wife. I would bet at the time, a visit to the park was considered Ireland’s Best Day Out. 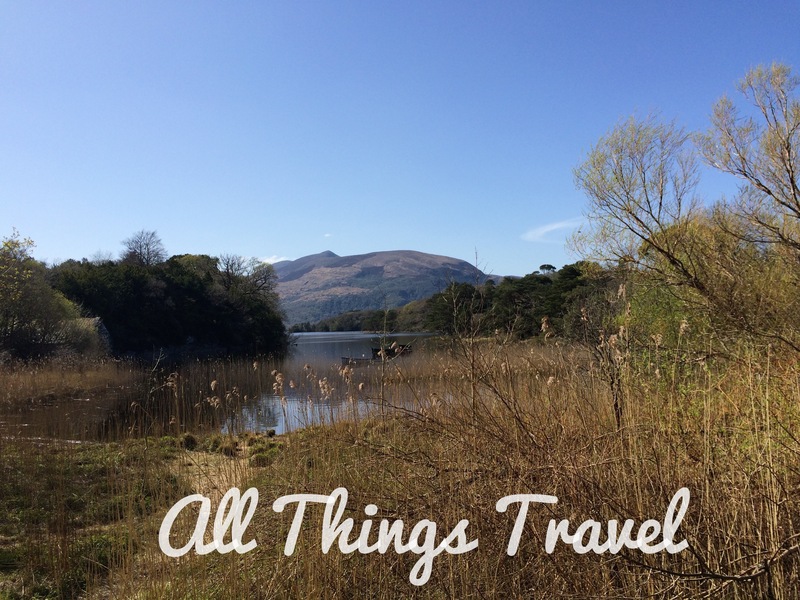 Eighty-three years later, if you’re looking for Ireland’s Best Day Out, you can still visit Killarney National Park. 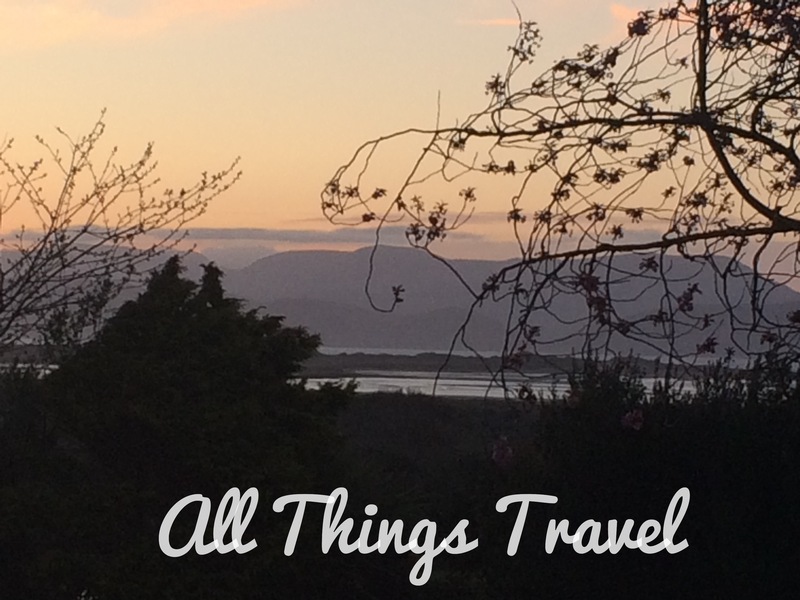 Traveling from the south, it may have been simpler to spend the night in Kenmare and head clockwise around the Ring of Kerry ending at Killarney National Park. 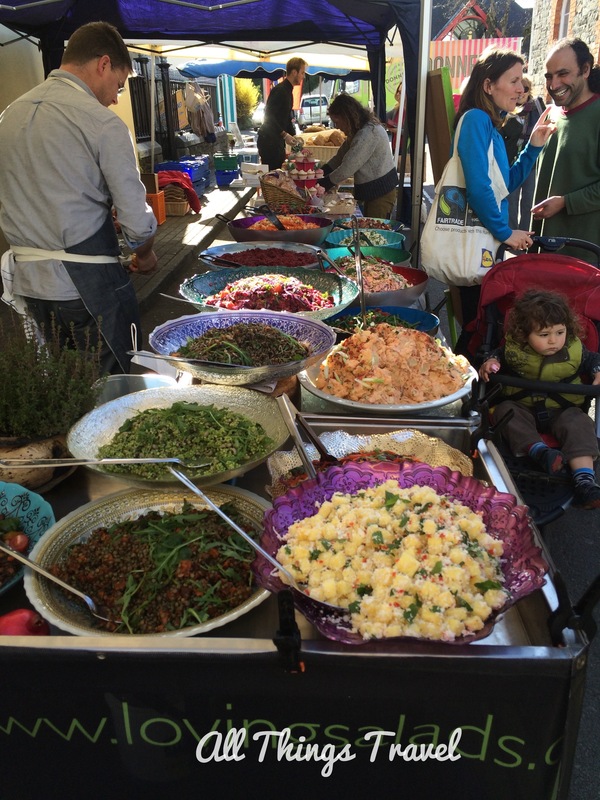 That’s how American travel guru, Rick Steves, and others recommend you tackle it. Irish tourist organizations, however, strongly recommend you drive counter-clockwise with the flow of traffic to reduce traffic issues. 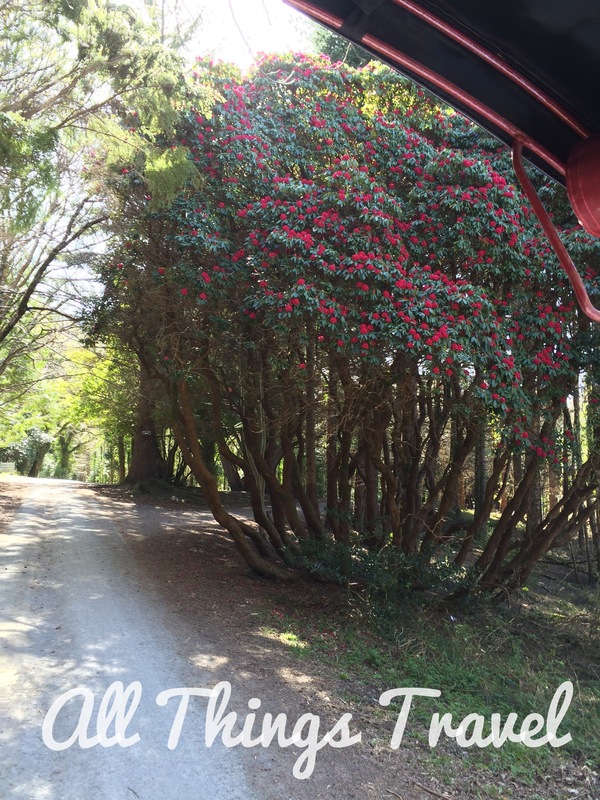 After several days on narrow Irish roads, we decided we would rather follow tour buses than face them. We opted to comply with local wisdom and circle the ring counter-clockwise or anti-clockwise, as they say in Ireland. After spending the night in Glenbeigh (marked on the map below), we left early the following morning to stay well ahead of the parade of tour buses leaving Killarney. This plan worked well for us. Although none of the guide books listed any accommodations in Glenbeigh, I found the Towers Hotel on the internet and booked it. Honestly, this hotel was a little long in the tooth but check out the sunset view from our room. It doesn’t get much better than that. The pub in the hotel served good pub grub for dinner and the following morning we had a traditional full Irish breakfast composed of fried eggs, bangers (sausages), rashers (thick bacon), tomatoes, black pudding (blood pudding with pork and fillers) and white pudding (without the blood) which was excellent. 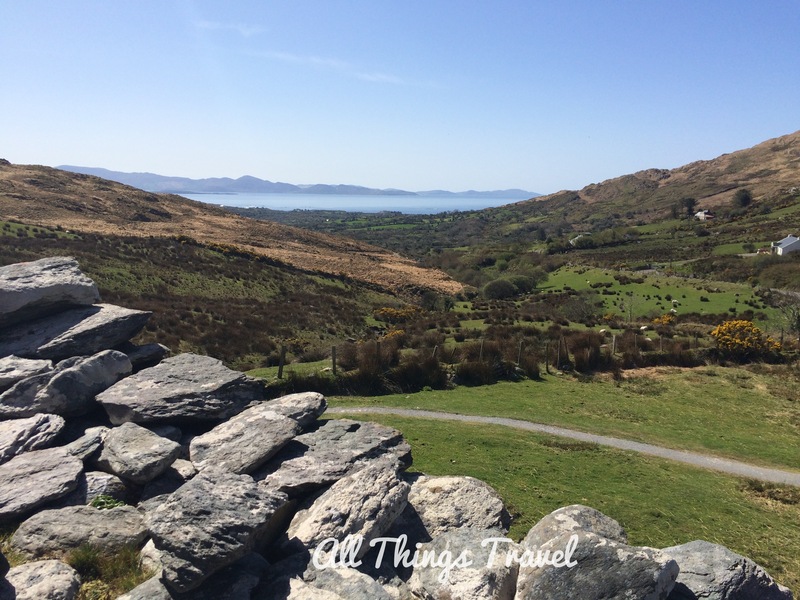 Fortunately, we didn’t meet much traffic all day and if you love scenic views, the Ring of Kerry has plenty to offer along N70, the main road. 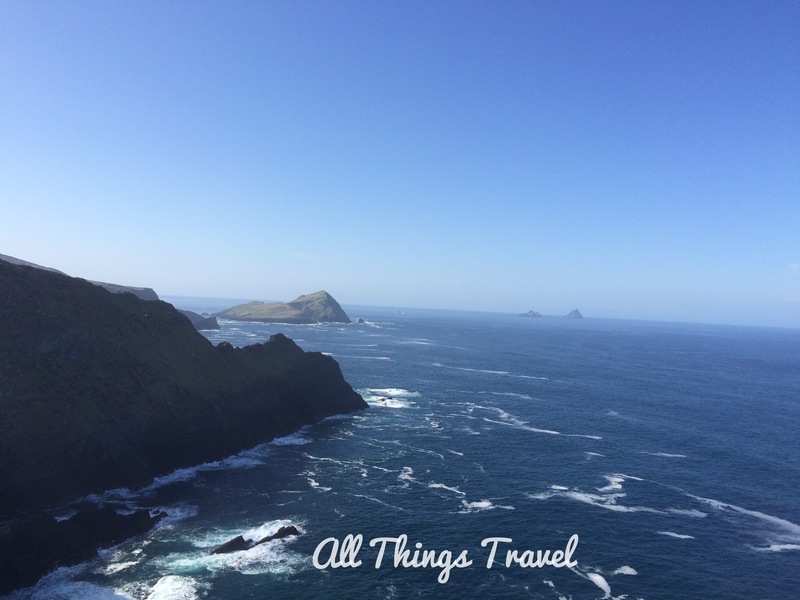 We left the main road to explore the Skellig loop for some extra outstanding views. 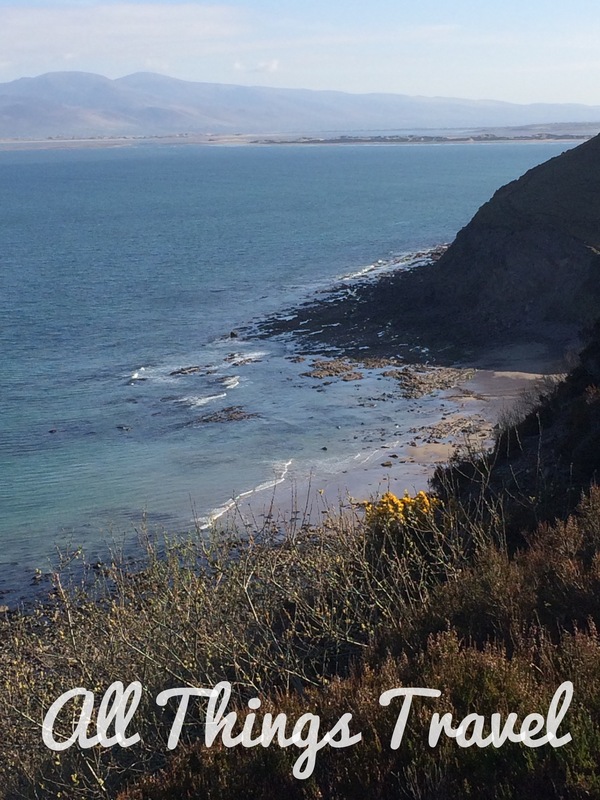 In fact, I would say that the views from the Cliffs of Kerry were among the very best we saw in Ireland. I’ve read plenty of complaints about the 4 Euro admission fee but I’m glad we paid it. 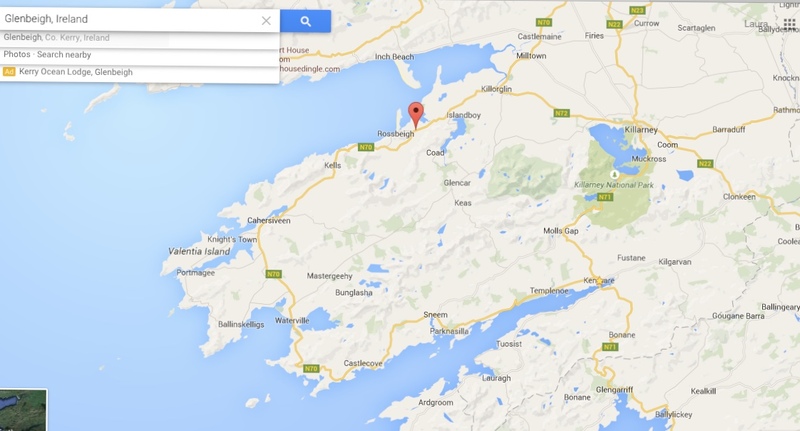 Also keep in mind you won’t see the Cliffs of Kerry on a big tour bus because the roads are too narrow for them. 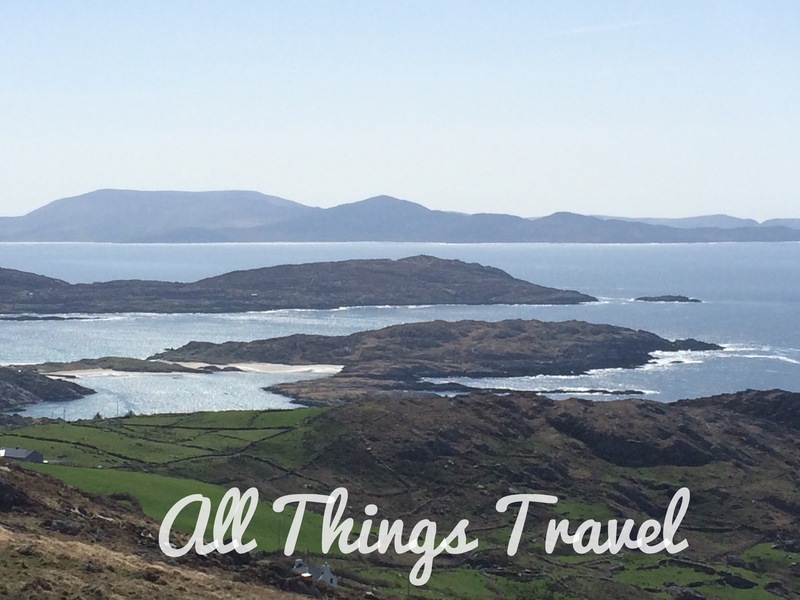 Many other areas along the Skellig Loop offered more incredible scenery worthy of a stop and a photo. When we returned to the main road and stopped at yet another vantage point, we discovered a man with these sweet little mountain sheep lambs. For a small donation, we each got a photo. 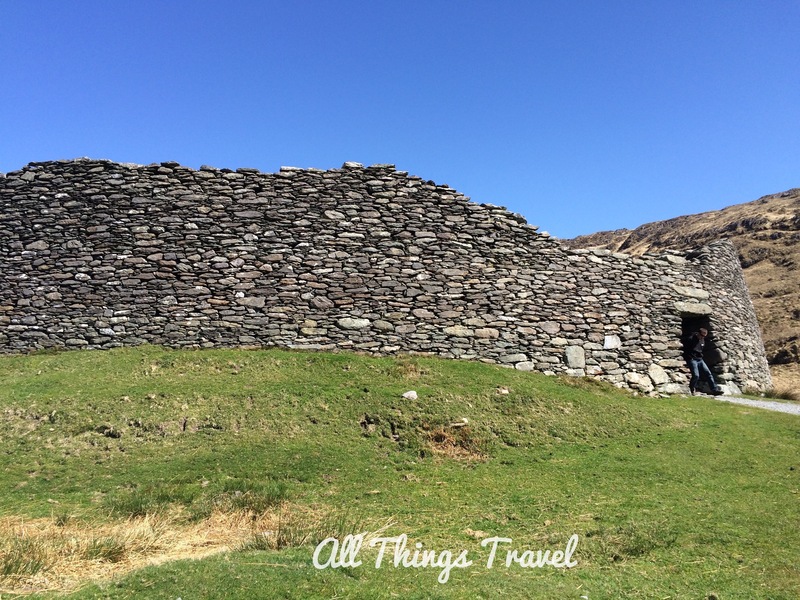 Located 2.5 miles off N70 along a narrow one lane track, we explored Staigue Fort, dating from around the first century, AD. 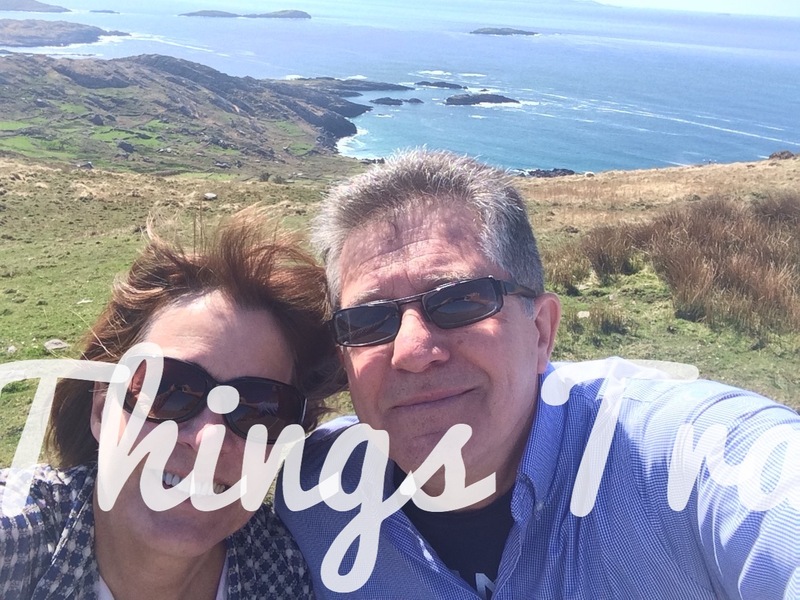 One of the largest and finest ring forts in Ireland, it was well worth a look. There are three such forts on the Ring of Kerry which provided protection to local chieftains, family, guards, and servants. 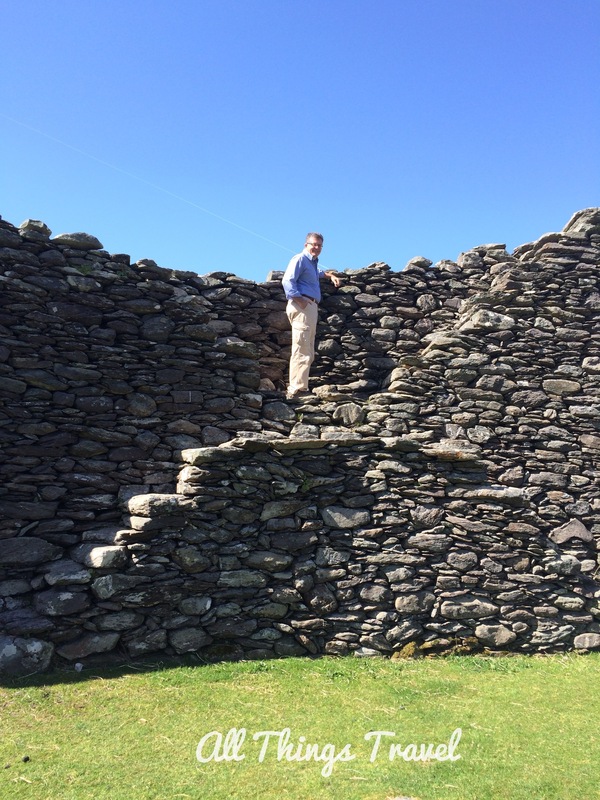 The fort was constructed by stacking the stones with no mortar whatsoever. 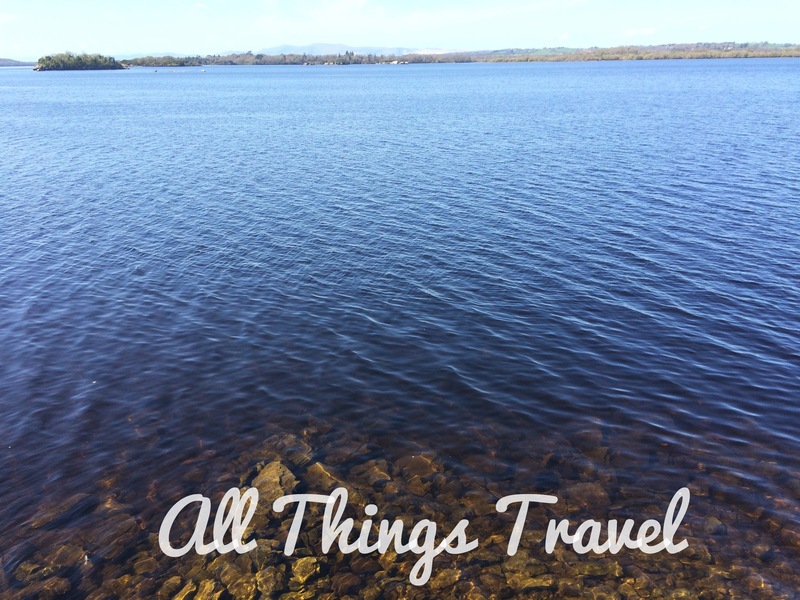 We finally arrived in Kenmare, where we had a reservation for the night at the Brook Lane Hotel. Although it was undergoing some renovation while we were there, it was nonetheless an outstanding accommodation. Even the restaurant, No. 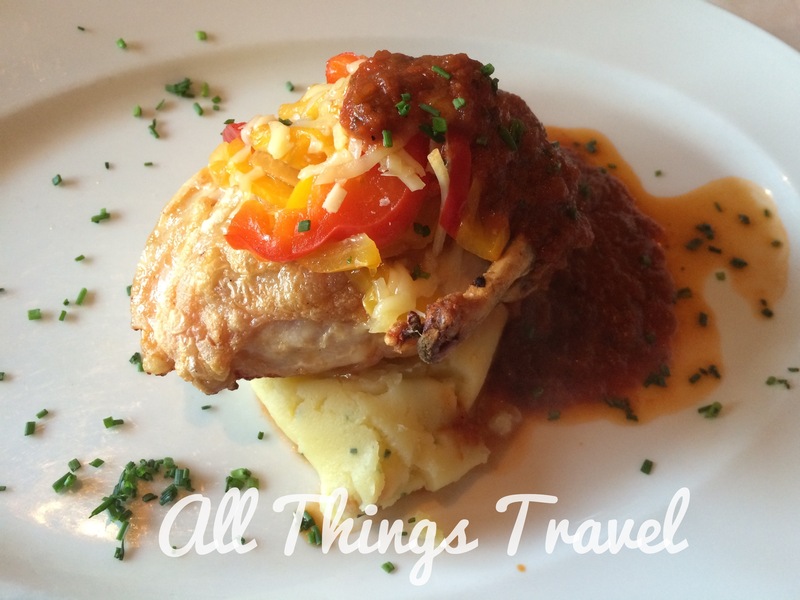 35, won us over with its organic, locally sourced menu items. 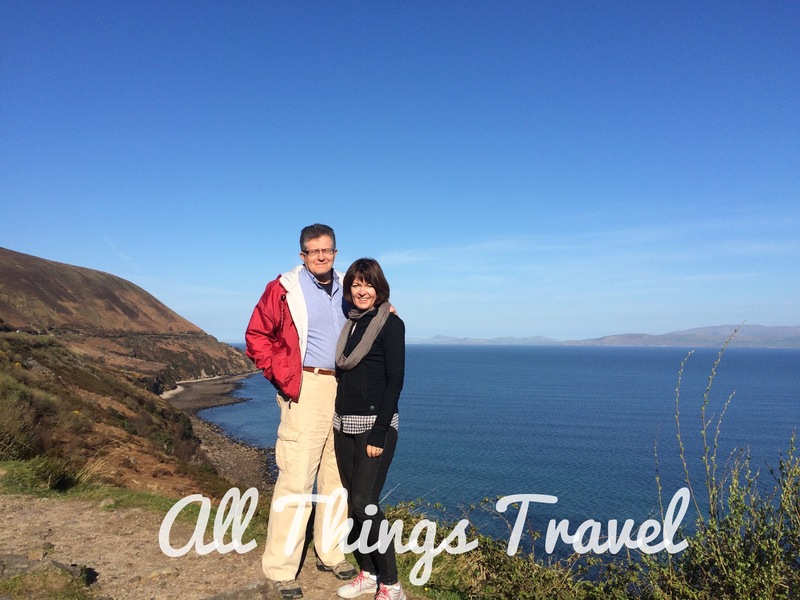 We barely scratched the surface seeing the sights offered on the Ring of Kerry. This is definitely an Irish gem that warrants more time and attention than we were able to devote this time around. 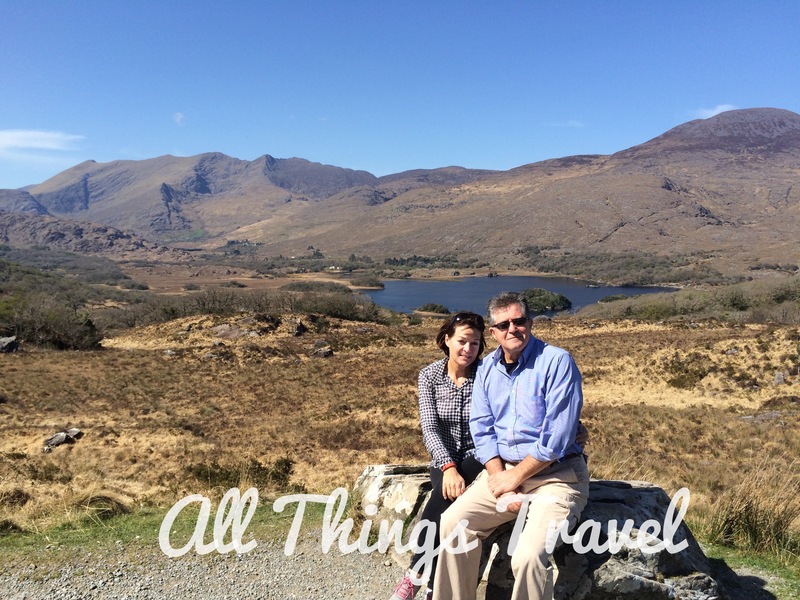 After this taste, I would love to return and savor the sights on the Ring of Kerry at a slower, more relaxed pace. 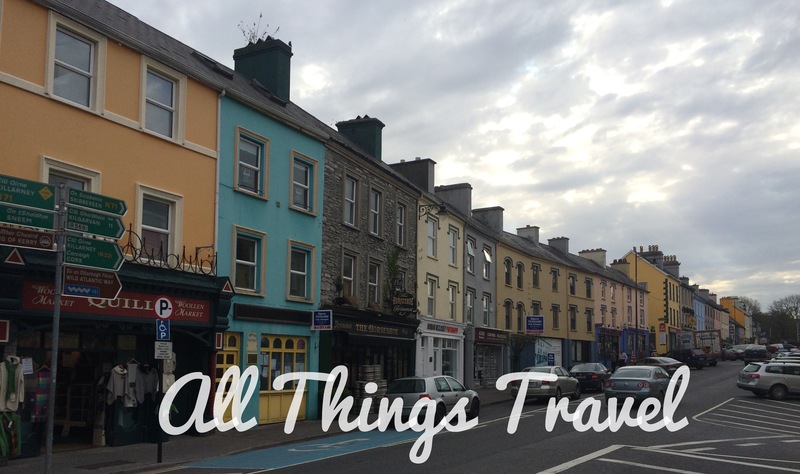 Kinsale is a delightful town in the south of Ireland with a lot going for it. 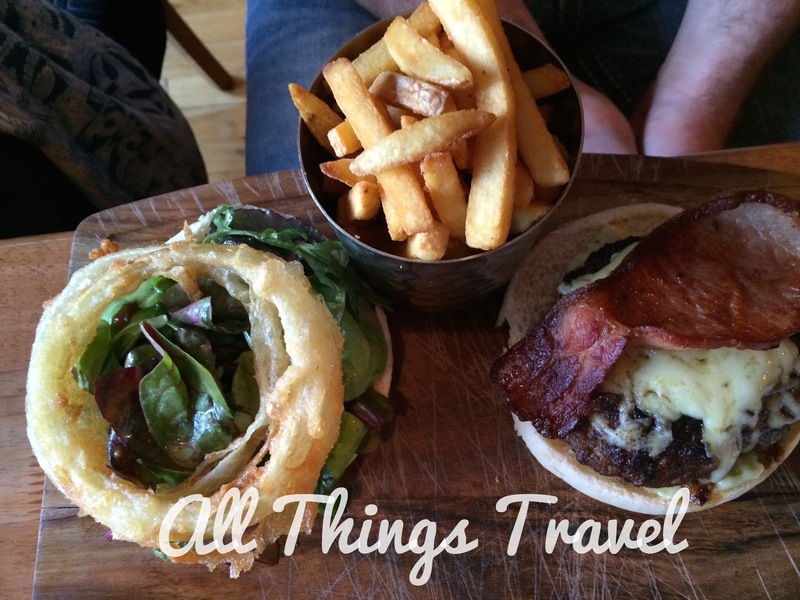 First, it is known as the foodie capital of Ireland. When I read that, I knew my son and daughter-in-law would want to go. 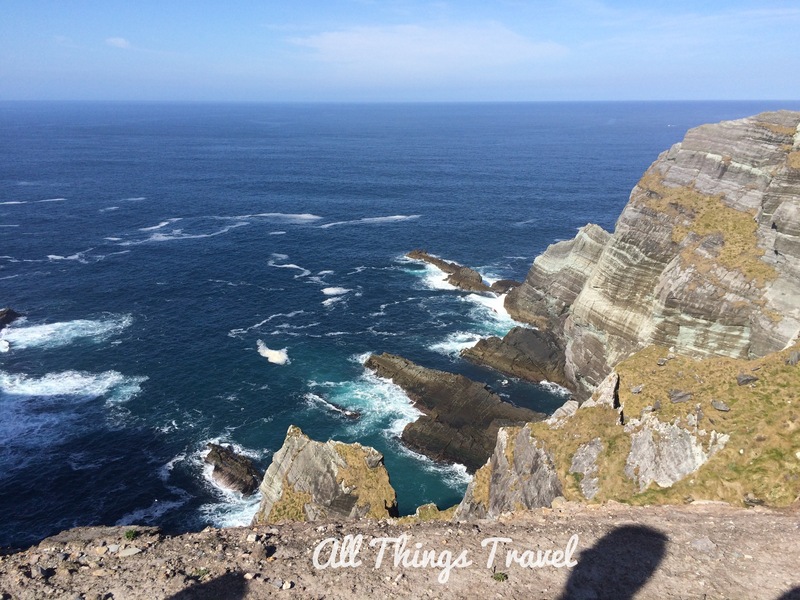 Second, it’s along the Wild Atlantic Way, “the world’s longest defined coastal touring route” (www.wildatlanticway) which I was keen to travel. Third, it’s steeped in history from the Spanish Armada to the sinking of the Lusitania. I call that a travel trifecta. We stayed at a lovely bed and breakfast by the name of the Old Presbytery which I thought sounded perfect for a couple of Presbyterians. The proprietor later explained the presbytery was where the Roman Catholic parish priest lived. Oh well. 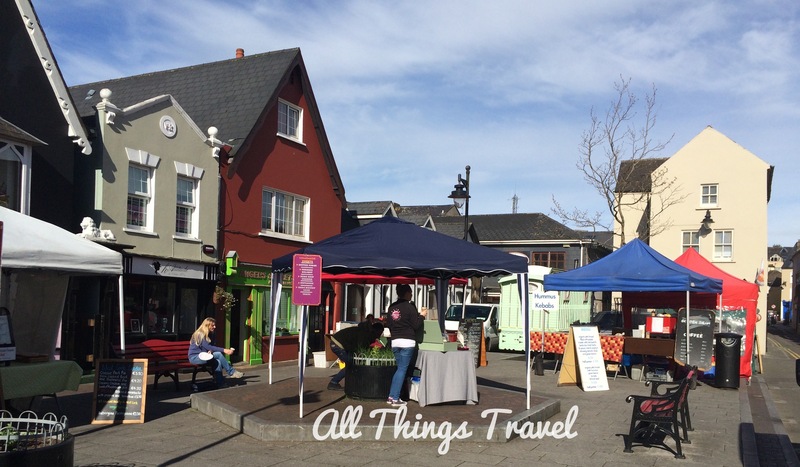 The location was perfect with parking provided and our breakfast the next morning of salmon and eggs was worthy of the foodie capital. The nice thing about staying in a central location in a small town is everything is within walking distance. That evening we strolled through town to Fishy Fishy for dinner. We didn’t have a reservation so we had to wait a bit for a table but it was well worth it. The food was outstanding. They were short-staffed later in the evening so, in all honesty, our service was a bit slow, but the staff in the kitchen prepared excellent food that was fresh and locally sourced. 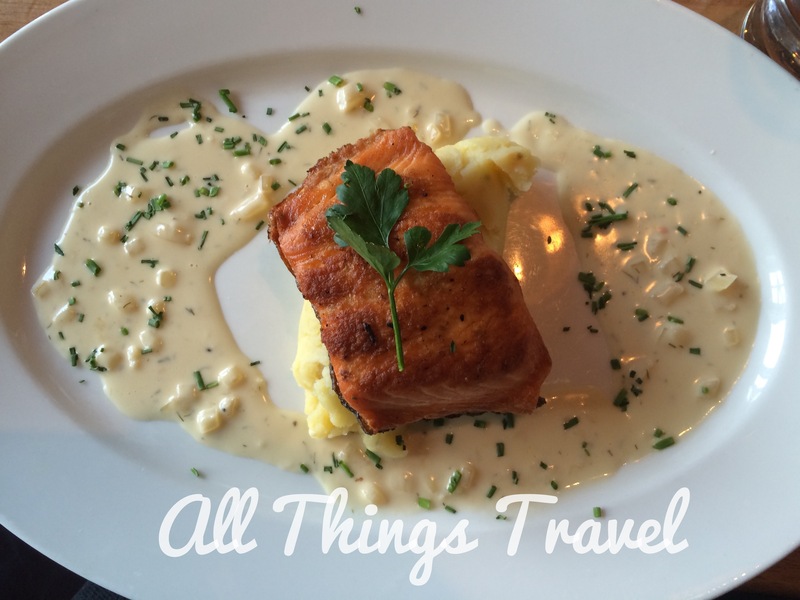 As I was writing this post, I saw Fishy Fishy recently won the Best Seafood Experience at the 2015 Irish Restaurant Awards. That probably means more than any recommendation I can give. 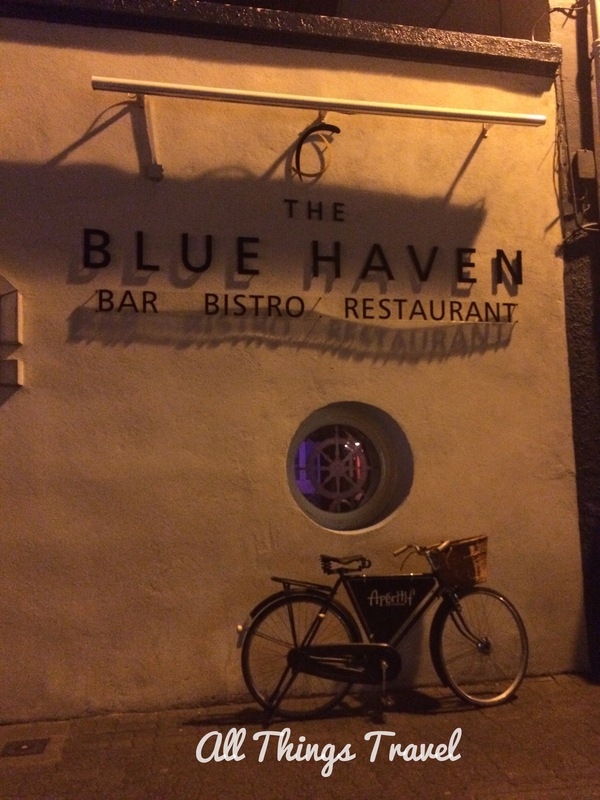 After dinner we stopped by the Blue Haven for some live music. The place was packed but the music was more folk than traditional Irish so we didn’t stay long. Nevertheless, it was a nice way to end the day. 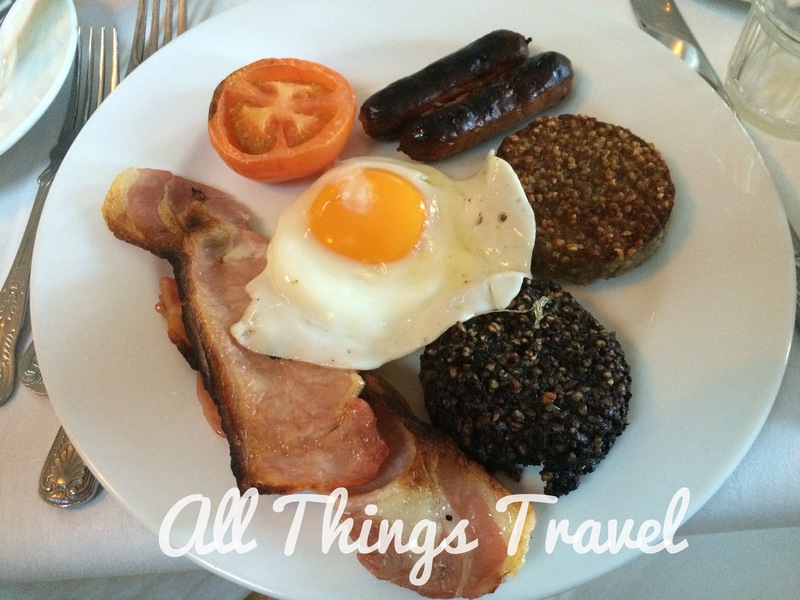 The following morning after our delicious breakfast at the Old Presbytery, we explored Kinsale on our way to check out Don and Barry’s Historic Stroll. 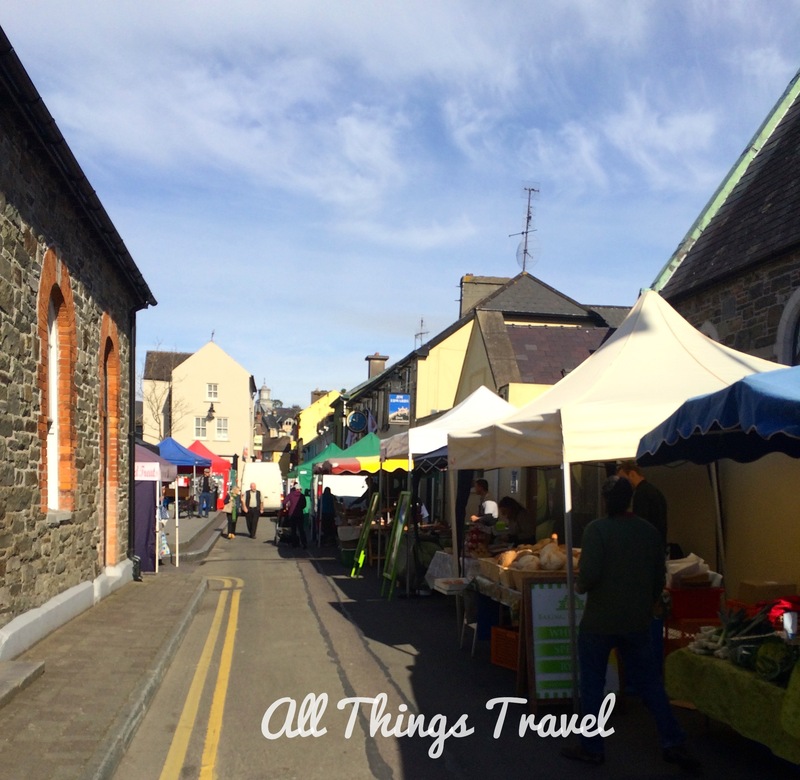 It was farmer’s market day in Kinsale with lots of options for scrumptious products. We were the first to arrive at the Tourist Office where we were to meet our tour guide for Don & Barry’s Historic Stroll. Rick Steves says, “This walk is Kinsale’s single best attraction,” (Don & Barry’s Historic Stroll brochure) so we had high expectations. 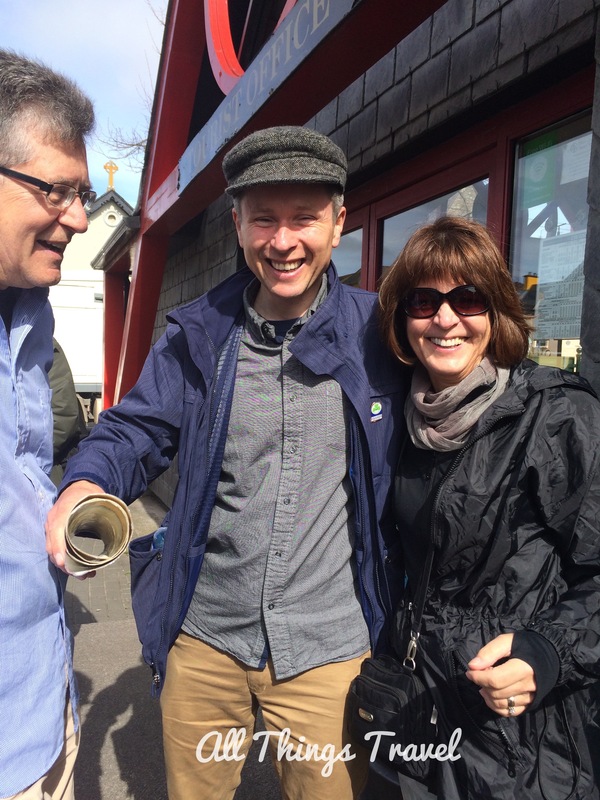 We met Barry and as we stood there chatting, he asked whether we planned to go to Dingle and explained that Rick Steves had an excellent self-guided tour of the Dingle Peninsula in his Ireland guide book. 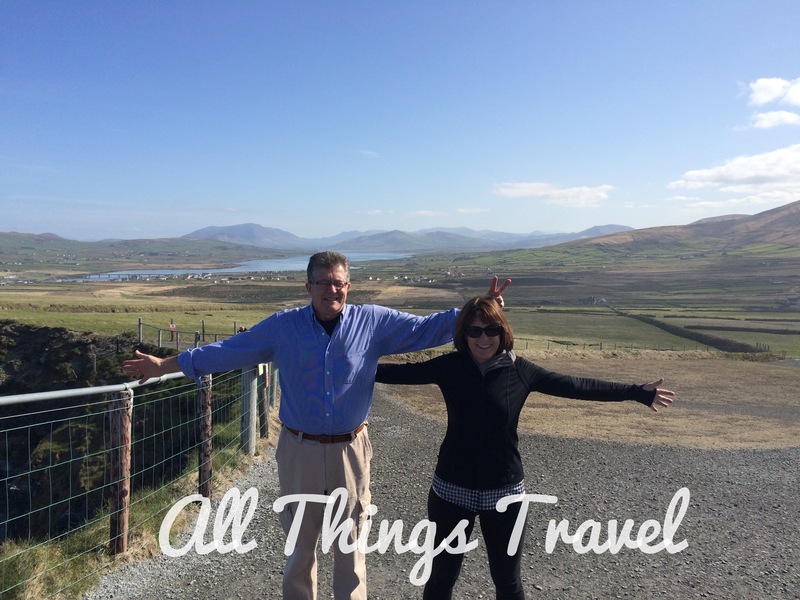 When we said Dingle was on our itinerary, he went off somewhere and returned shortly with the Rick Steves 2014 guide book in hand. He insisted we take it. When we discovered he works as a guide for Rick Steves, we figured he probably gets a new book each year but we were happy to receive last year’s edition. By the time the tour started, our ranks had swelled to around 20 tourists and one local. 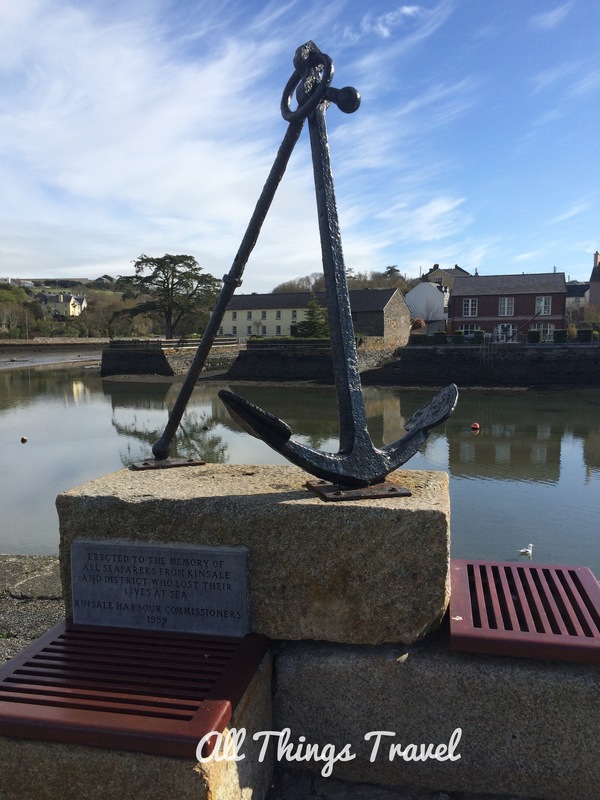 We began at the waterfront where we learned that, historically, the Kinsale harbor enjoyed great naval significance due to its sheltered location and the changing tide levels which moved wind powered ships in and out even without wind. Several important historical events occurred here. In 1601, the last Spanish Armada entered the harbor to wrest Ireland from the English with the help of the rebellious Irish in the Battle of Kinsale. In the end, the English prevailed leading to the “Plantation of Ulster,” a plan to permanently subjugate the Irish by seizing their land and granting it to colonists arriving from England and Scotland. The Lusitania was sunk by a German submarine off the coast of Kinsale in 1915 during WW1. This event turned American public opinion against the Germans and eventually led to U.S. entry into the war. Germany suspected munitions were onboard to be delivered to the British and posted notices in New York that the ship might be sunk. To this day, there is disagreement over whether the sinking of the Lusitania was justifiable. The local that joined our tour added to the discussion from his viewpoint as a member of the committee for the centenary observance of the sinking of the Lusitania. 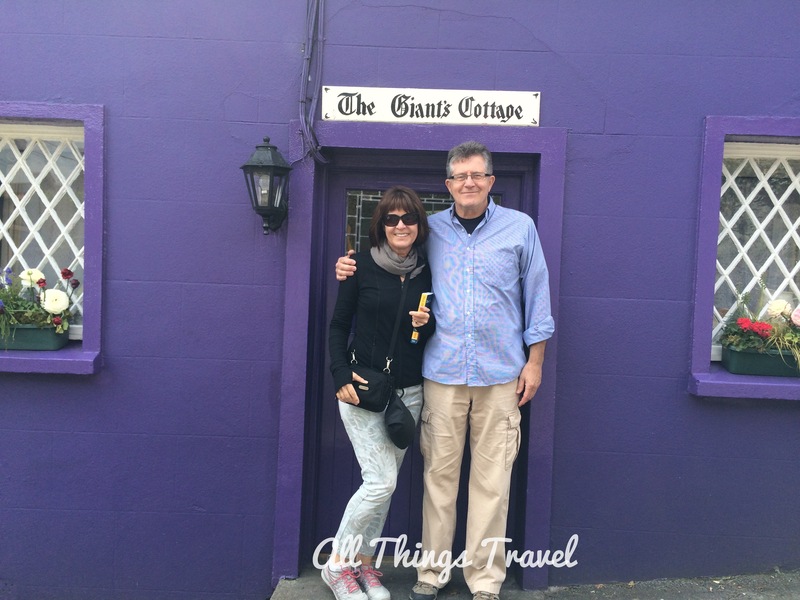 Barry regaled us with plenty of other intriguing tales about Kinsale. For example, Alexander Selkirk, the buccaneer whose survival on an uninhabited island became the basis of the novel, Robinson Crusoe, actually set sail from Kinsale in 1703. A year later he was put ashore in the San Fernandez archipelago where he managed to survive until 1709 when he was rescued. Then there was the story about the Kinsale Giant, Patrick Cotter, who was born in Kinsale in 1760 and grew to over 8 feet tall. He died at the age of 46 and his boots are on display at the Kinsale Museum. 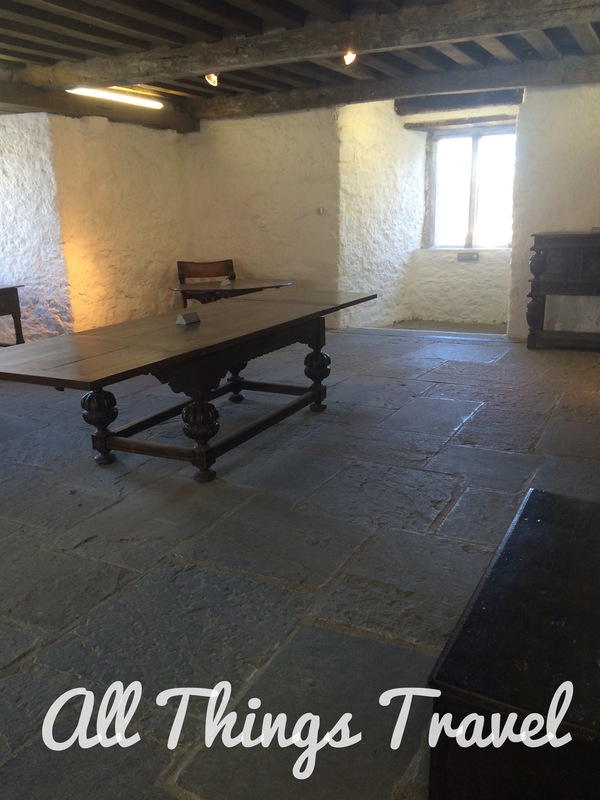 The last suggestion Barry left us with was to take a trip out to the Charles Fort, just outside of town. It’s a star fort built in 1767. 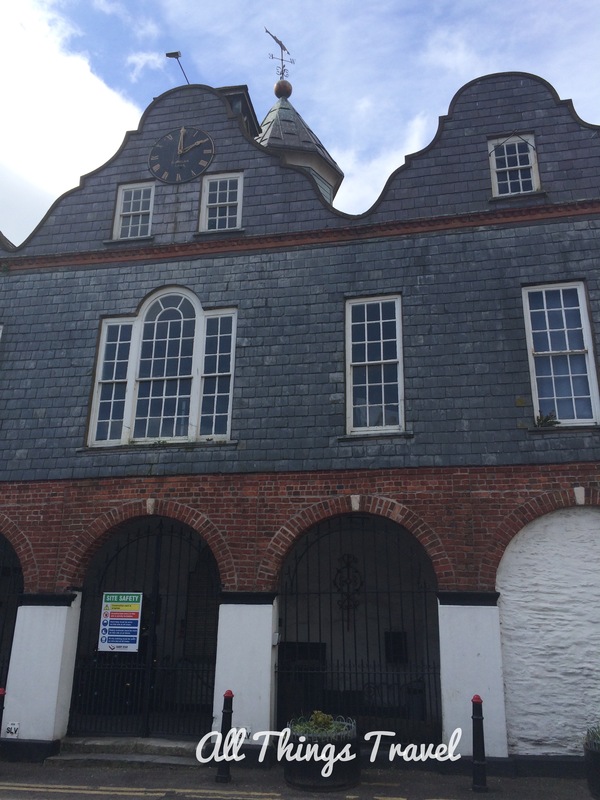 Due to the design enabling the defenders to catch invaders in a crossfire, Kinsale was never the sight of another attack. If you’ve heard the phrase “beyond the pale,” you likely know it means outside the boundaries. For example, if someone’s behavior is beyond the pale, it is outside what is acceptable. You may not know, however, where the phrase originated. The Irish will tell you it comes from the time period in Irish history when the English colonized Ireland. The Anglo-Normans invaded Ireland in 1169 and established English control but the further one got from Dublin, the seat of English power, the less control they could exert. By the 14th century, a perimeter surrounding Dublin was fenced or ditched for protection. The word pale comes from the Latin palus meaning stake and the pale was a term to describe a region with a staked or paled fence surrounding it for protection (www.worldwidewords.org). Anything outside that area was “beyond the pale,” meaning outside the boundaries of English dominion. 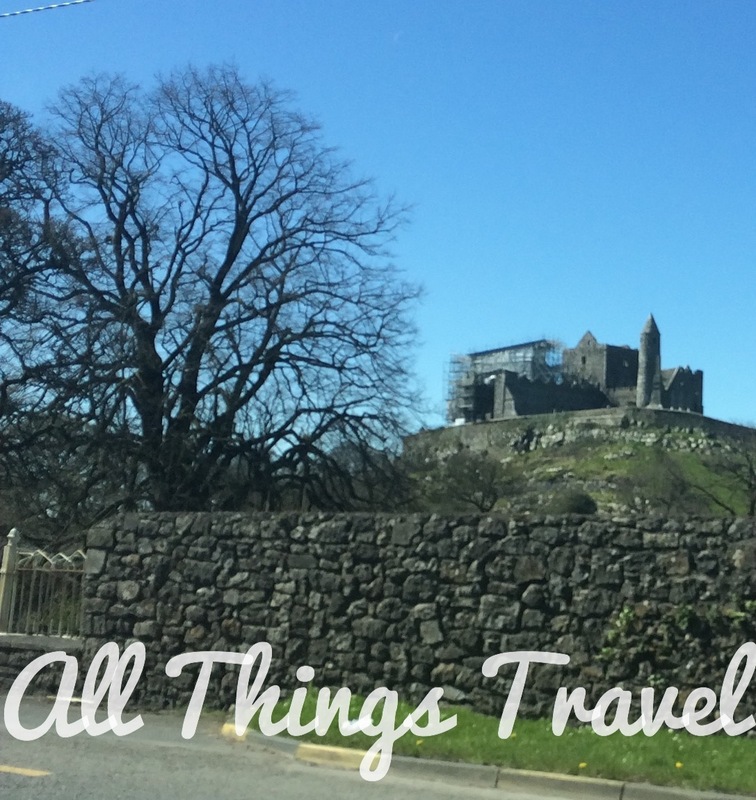 Our first stop was the iconic Rock of Cashel, a Heritage Site in County Tipperary, located just a two-hour road trip southwest of Dublin. 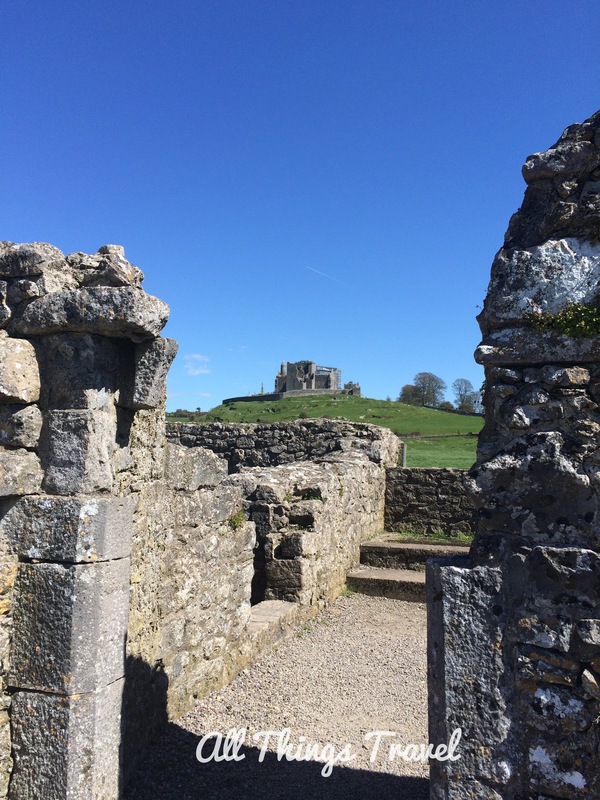 The medieval buildings atop a limestone outcropping are visible from miles away. I also spied lots of scaffolding which intruded on my imagining of life during that time period but ancient buildings need upkeep so I tried to ignore that. Somehow we missed the turn in town for the parking lot so instead we parked along the road and walked up from the back side which actually turned out to be an advantage. It was closer to the abbey we visited afterward and a lovely walk with gorgeous views of the Rock. 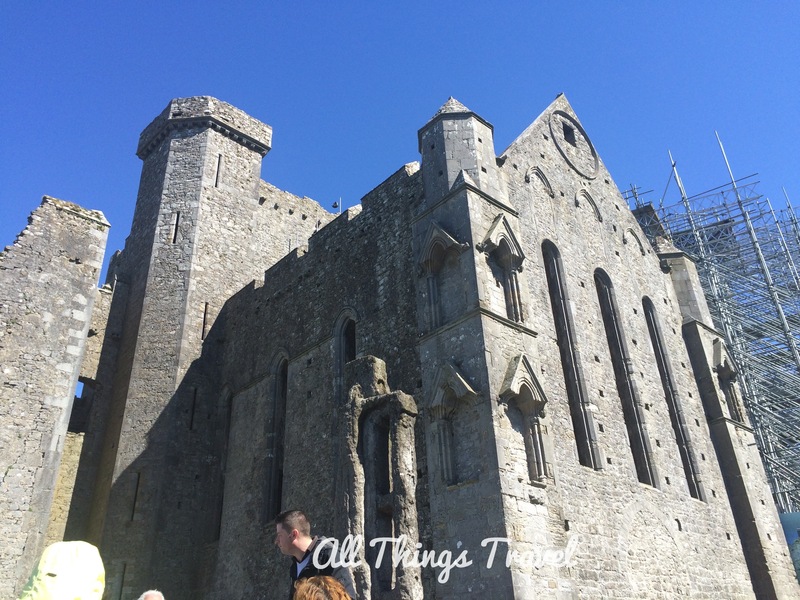 Historically, the Rock of Cashel had obvious strategic importance. You could view and defend a wide area from this location as you can tell from the photo below. In the fourth or fifth century AD, there was a fortress on this site under the kingship of Conall Corc. 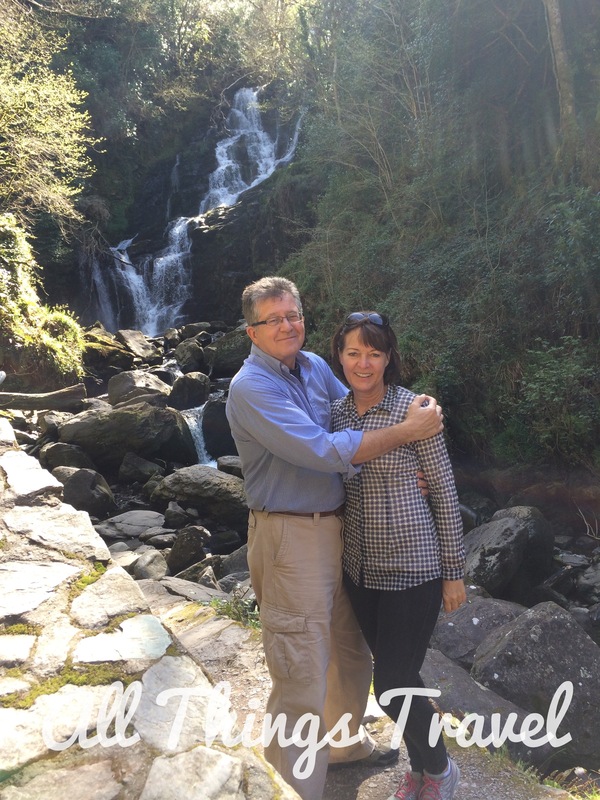 Legend has it Saint Patrick baptised Conall Corc’s grandsons at this location, too. 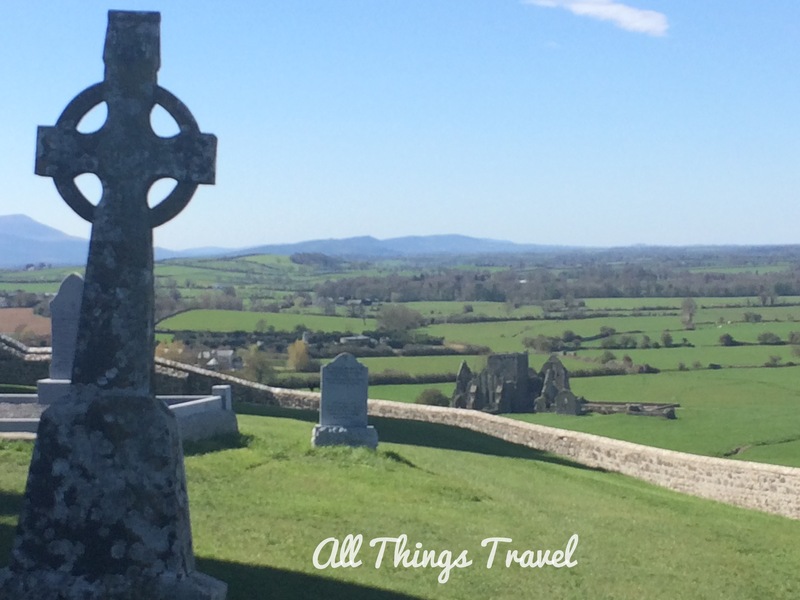 In 978 AD, Brian Boru became King of Cashel and if you’ve followed my blog, you’re familiar with him. 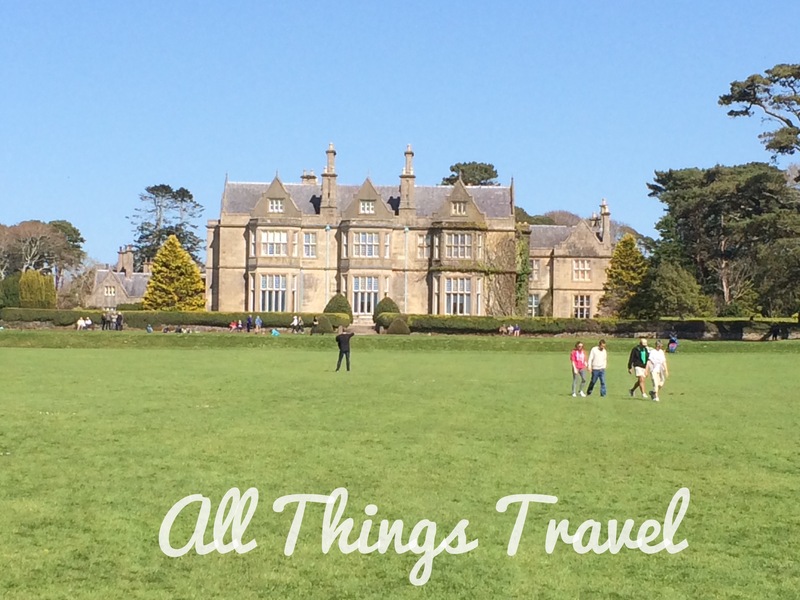 If not,check out the earlier posts about Clontarf Castle and the National Museum of Ireland. 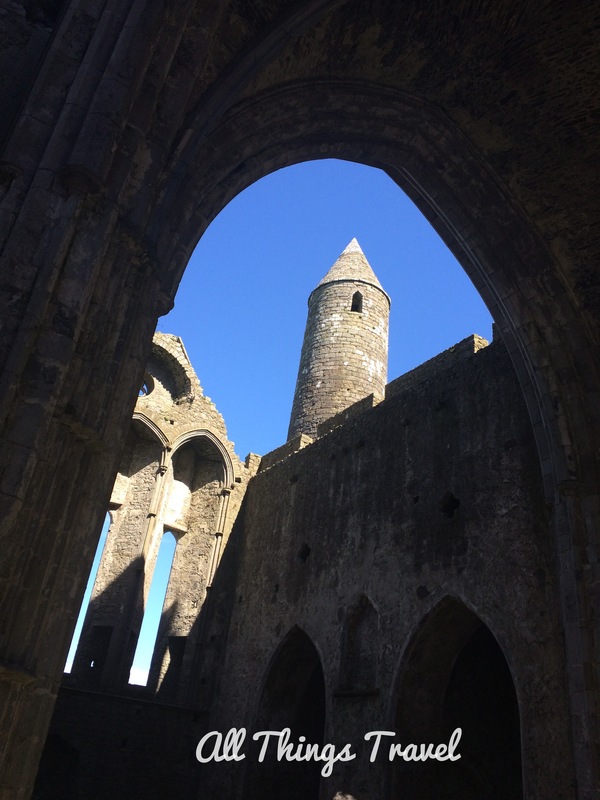 The Rock of Cashel became church property in 1101 by a gift from Muircheartach Ua Briain, who was then King of Cashel. The church or cathedral that would have been built at that time no longer stands but Cormac’s Chapel was consecrated in 1134. 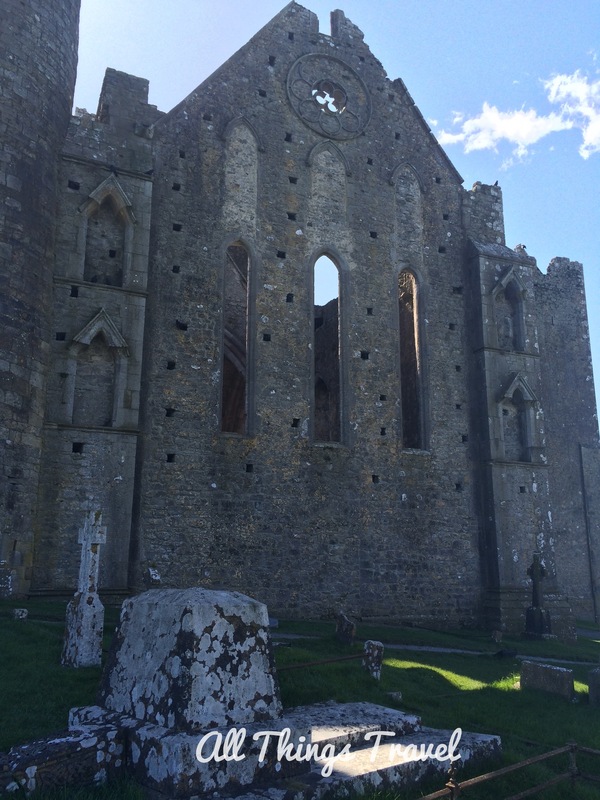 Built in the Romanesque style, it is one of the earliest churches in Ireland and is truly a treasure. Notice the stone heads looking down from the top of the chapel. The guide asked us who we thought they were. Some guessed kings or other royalty. 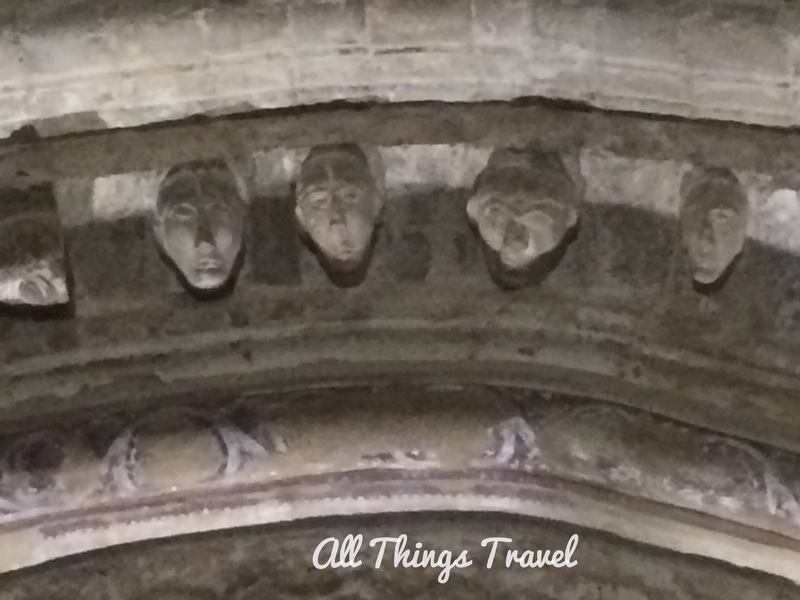 He told us these heads were self sculptures of the workmen who built the chapel, their autographs, if you will. What a creative and interesting way to seek immortality. There’s a close up below. 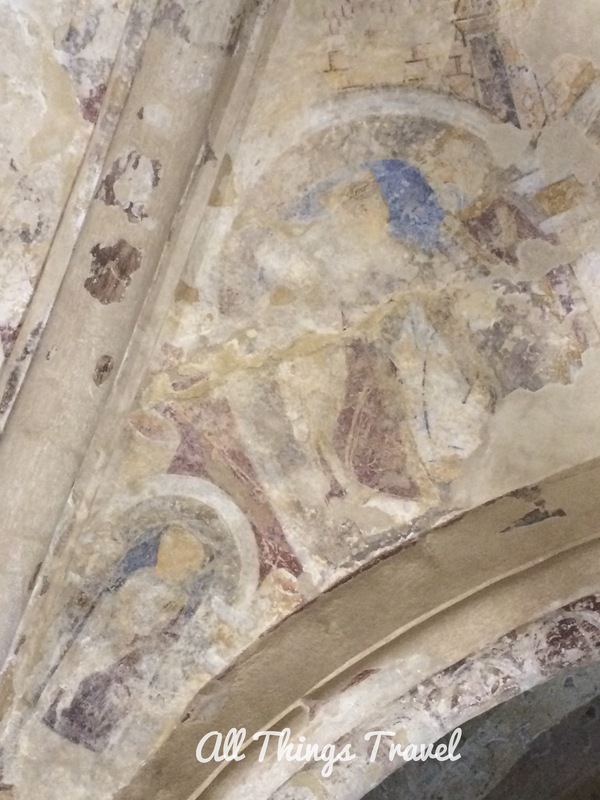 The chapel originally contained colorful murals covering the walls but they were painted over many years ago. Small areas have been painstakingly cleaned to reveal hints of the early exquisite beauty. 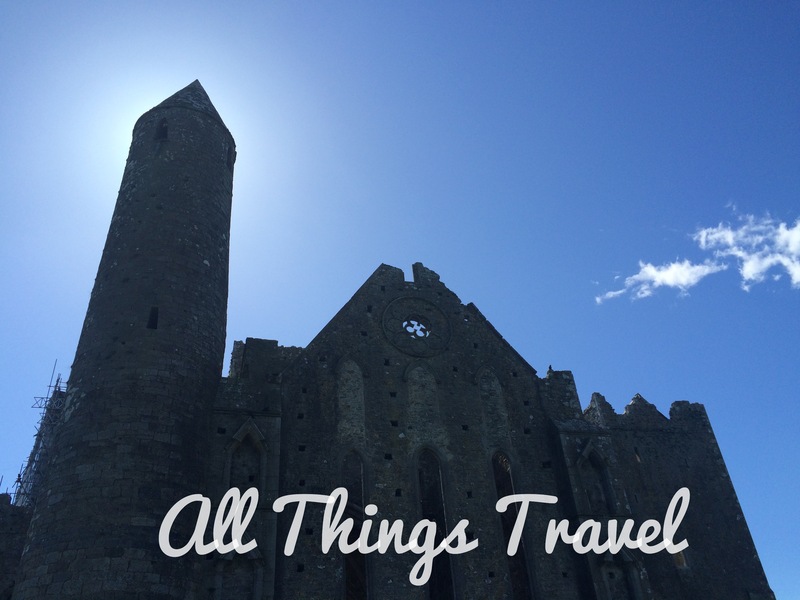 The oldest remaining structure on the Rock of Cashel is the round tower, or bell tower, which dates to around 1101. Amazingly, it is still intact which our guide explained is due, in large part, to the design. 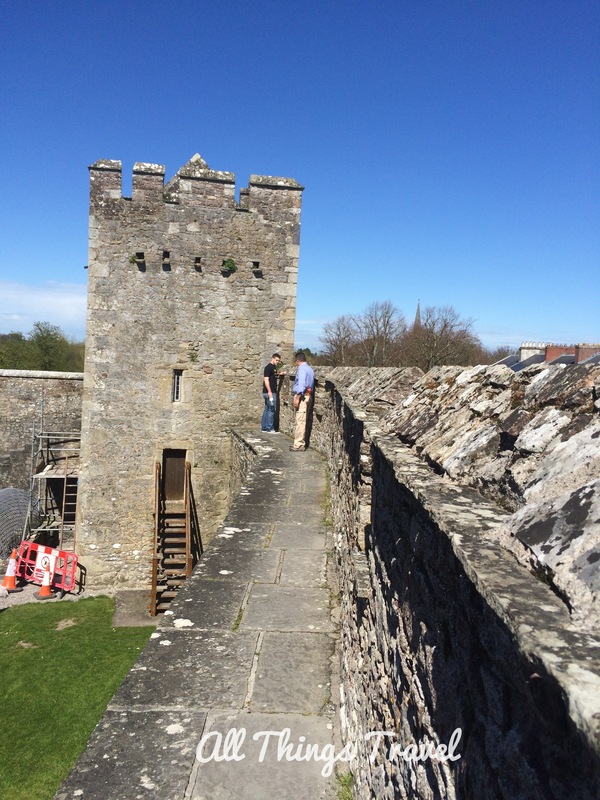 The doorway to Irish round towers is typically 6-10 feet above ground level requiring a ladder to access the tower. Previously, historians conjectured this feature was for security so that the ladder could be pulled up and access denied to invaders. Our guide explained, however, the wooden door could be easily breached by burning or chopping it open. The real reason for the elevated doorway was to provide stability to the structure. 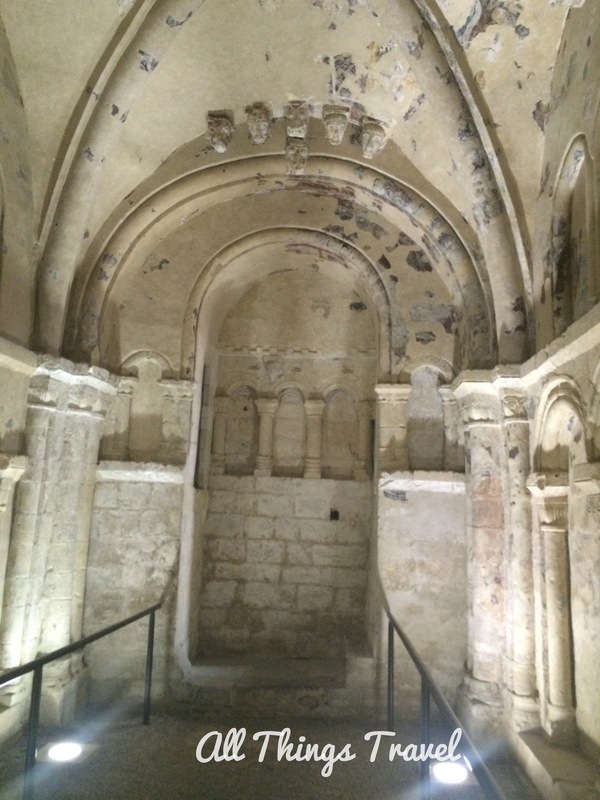 Another Cathedral was built in the 1200’s to fit into the space not occupied by the chapel and the round tower. 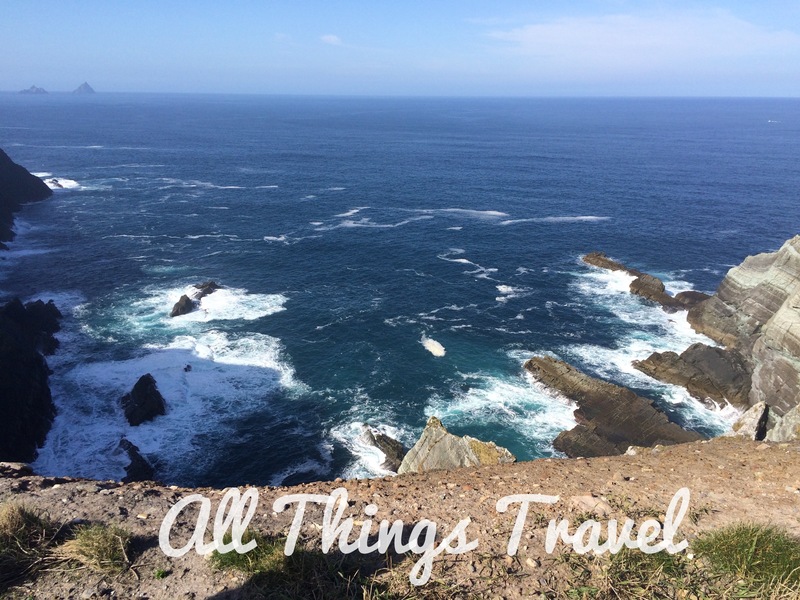 I’ve mentioned our tour guide several times throughout this post. He was knowledgeable and informative and my son noticed that his name tag said Lawlor, which is a variation of Lalor, my husband and children’s surname. Of course. 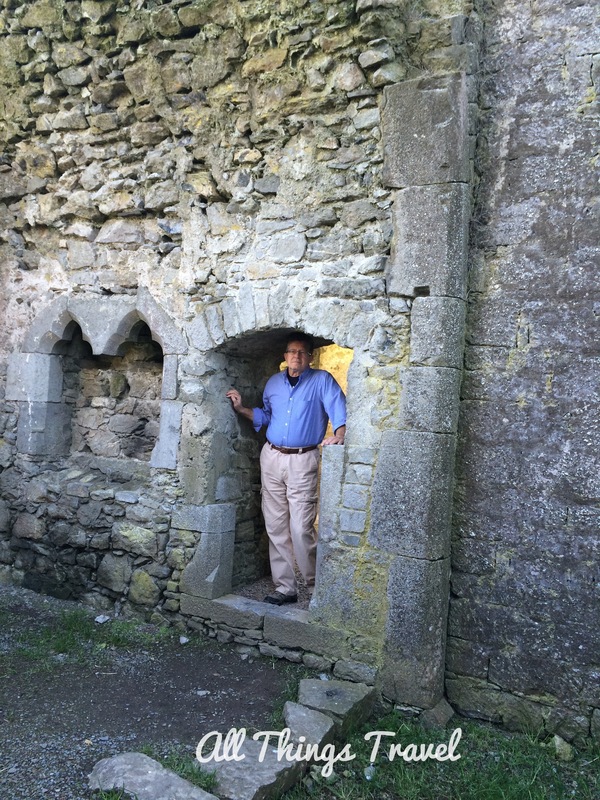 Just down the road from the Rock of Cashel, we visited Hore Abbey, built in 1266 by Benedictine monks. Not long after, however, the Benedictines were expelled and the monastery was given to the Cistercians. The abbey was in ruins but it was a pleasant walk on a beautiful day. 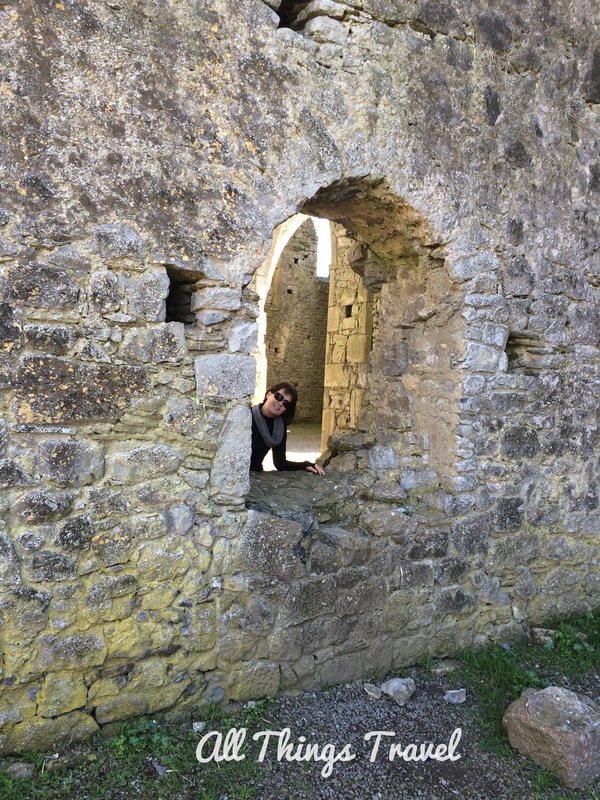 After wandering around the abbey ruins, we drove to nearby Cahir Castle on the Suir River just 12 miles down the road. 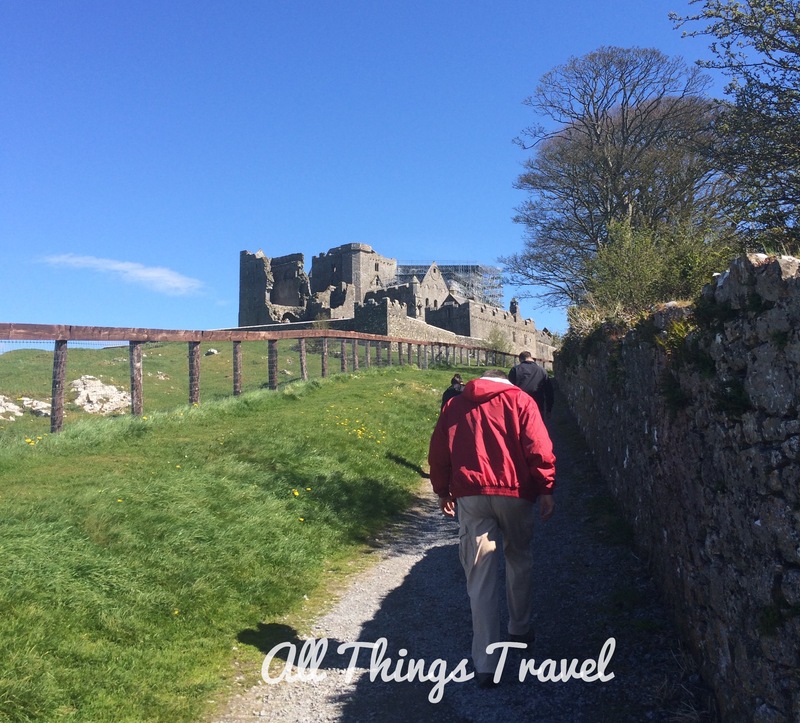 Another Heritage site, this castle is one of the largest and best preserved in Ireland, and in its day was considered impregnable. 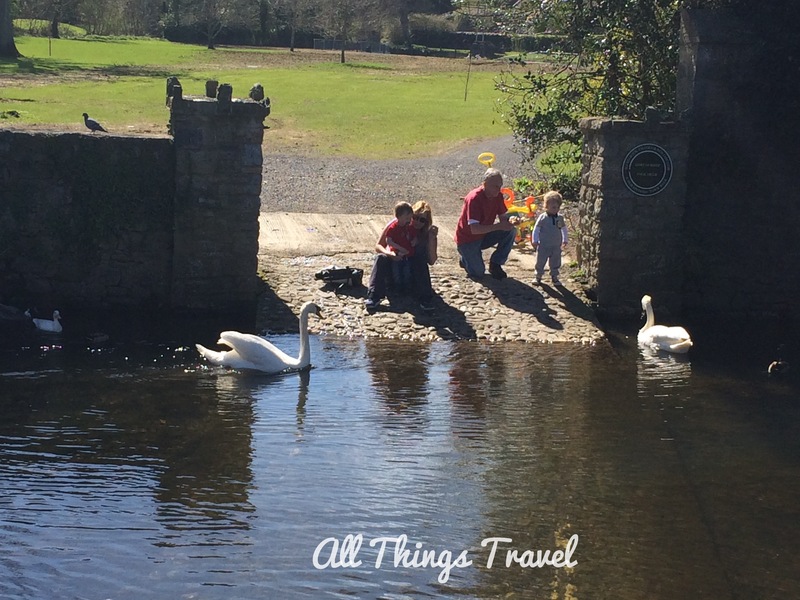 Erected in the 13th century, it is thought to have been built by Anglo-Normans as a defensive structure and show of power to warn the Irish that they now controlled the land. The current structures date from the 16th century. It was closed for renovations and reopened just in time for our visit. 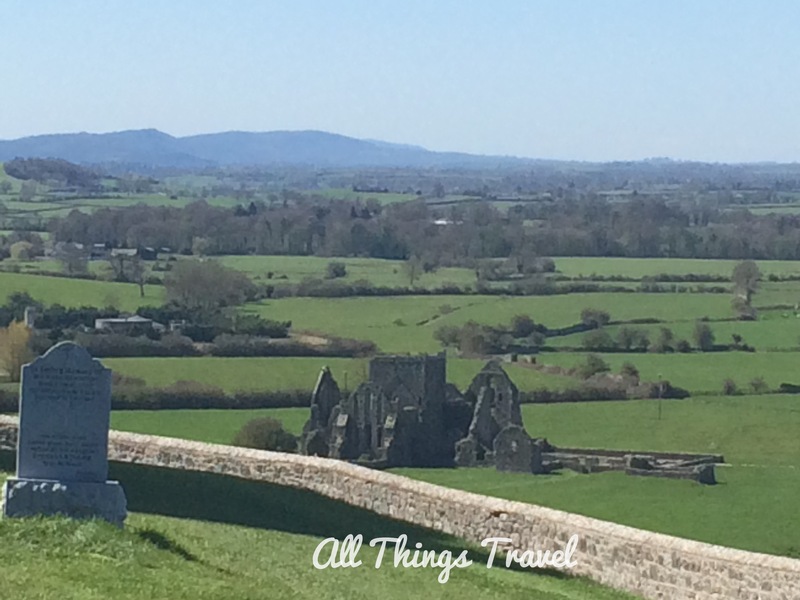 We thought we wouldn’t have enough time to do it justice after spending so much time at the Rock of Cashel and Hore Abbey but when we heard admission was free that day, we decided to have a look and we were so glad we did. When we visited Ireland 10 years ago, we noticed a definite lack of restriction on exploring somewhat dangerous sites. We are respectful visitors who don’t take unnecessary risks so we appreciated that freedom. 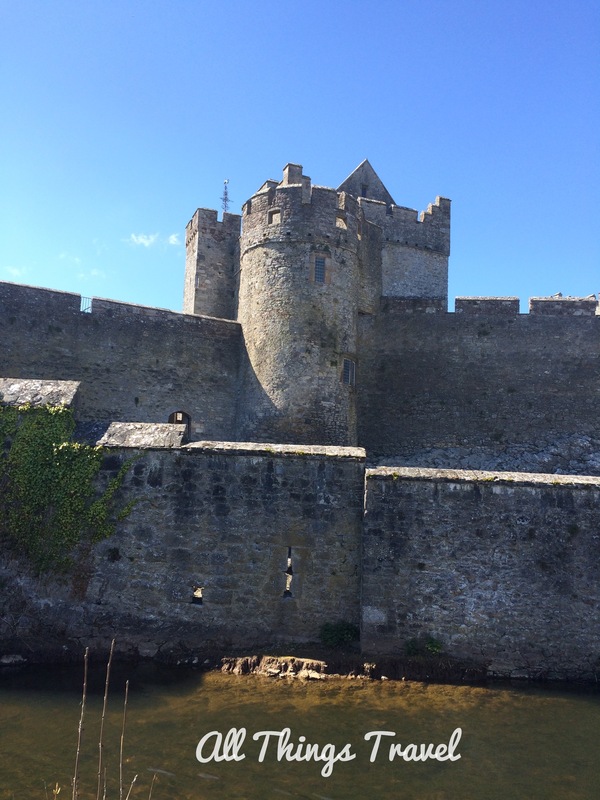 This time, it seemed more areas were off-limits but, fortunately, we were allowed to walk the walls at Cahir Castle. I doubt this would be allowed in the U.S. 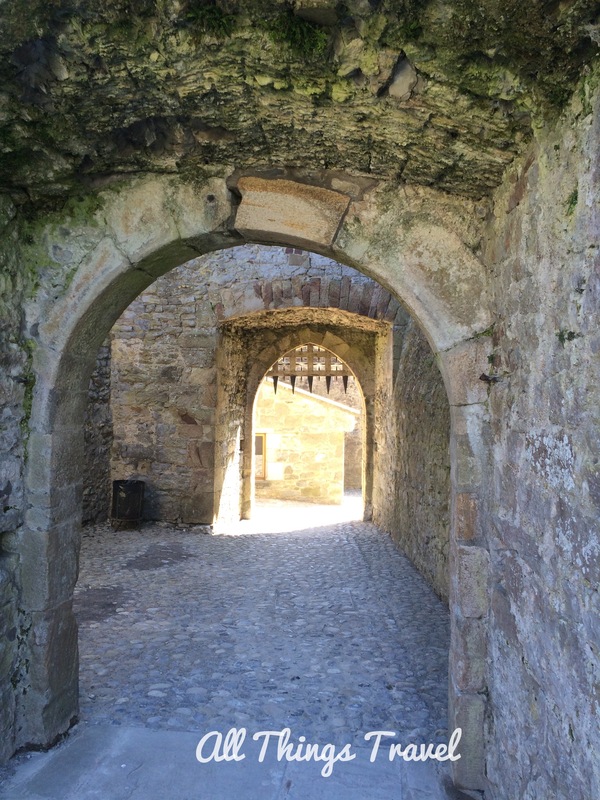 The purpose of the portcullis, or gate, was to close the castle off from attack. It is still operational today and can be seen in the photo below. Inside the keep we found an extensive exhibit about the role of women during medieval times. Often, the history presented about castles is mostly military and I prefer social history so this was particularly welcome to me. 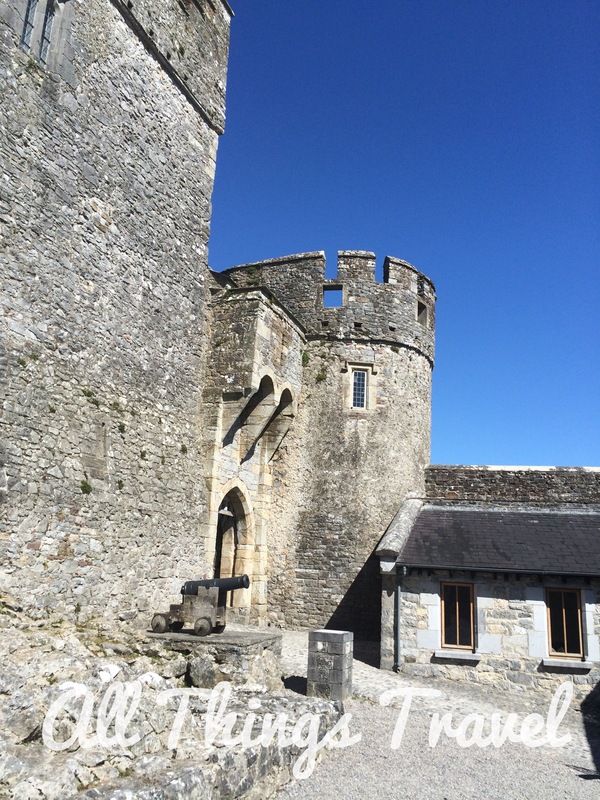 Although there were not a lot of noblewomen in the castle, the areas they inhabited were more comfortably furnished with inner courtyards and gardens to ensure the women were secluded from the garrison. 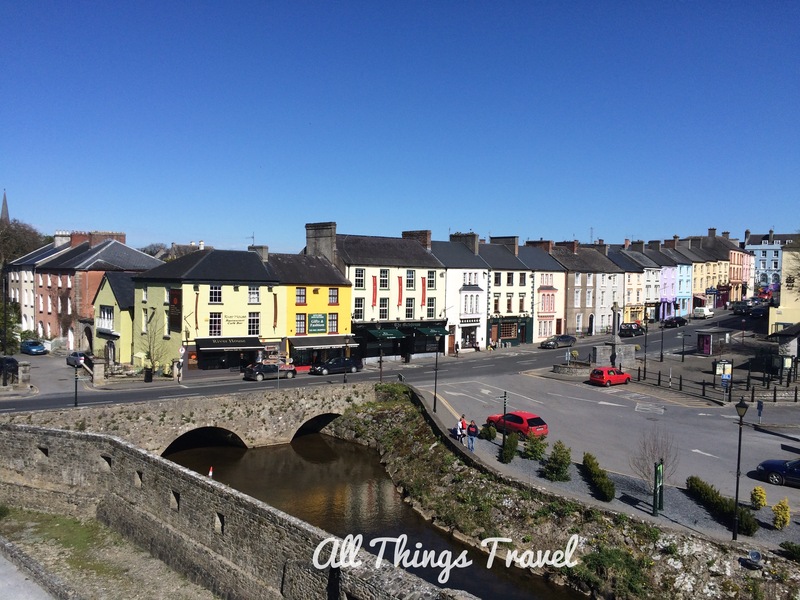 The charming small town of Cahir was visible from the ramparts of the castle. Although we didn’t have time to explore this town, I would love to go back. 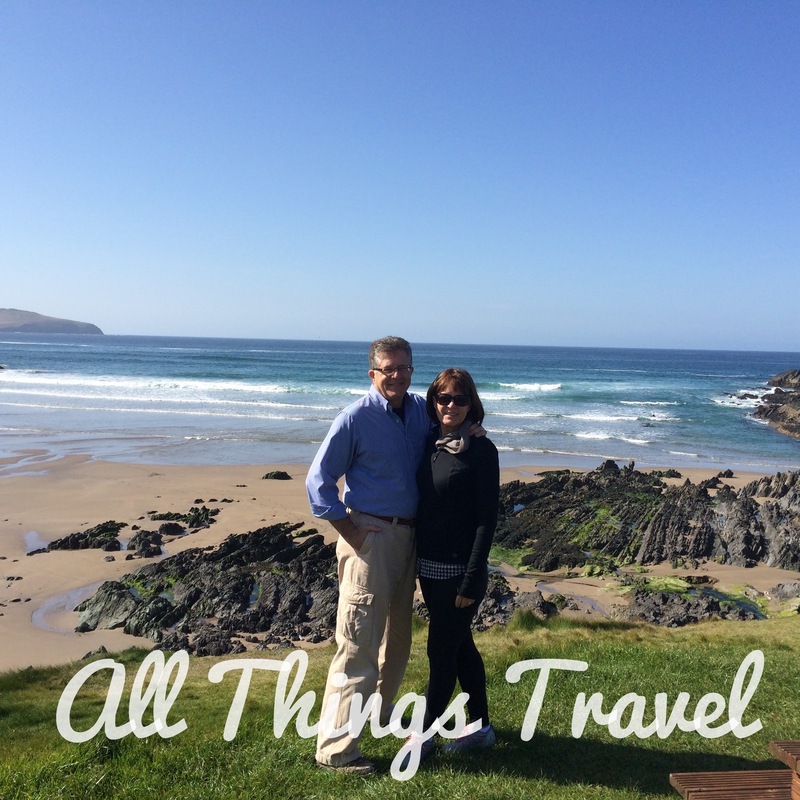 Next time we’ll continue beyond the pale as we begin our adventure on the Wild Atlantic Way.